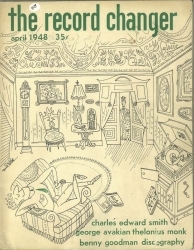 THE RECORD CHANGER, April 1948 - RARE MONK article and more! A pivotal early moment in THELONIOUS MONK's career - though he was already 30 - came with the profile in the April 1948 Record Changer. It parallels his first records on Blue Note and first appearances at The Village Vanguard (they were covered by The New Yorker). THIS IS THE FOUNDATION TO A DEFINITIVE MONK COLLECTION and the journalist who penned the article was future Monk producer, Orrin Keepnews. The April 1948 issue of The Record Changer presents an amazing first-hand glimpse into Jazz in its prime time! Features articles on the just-emerged Thelonious Monk (misspelled, missing the second O), by the recently deceased Orrin Keepnews, Clarence Williams, and a Benny Goodman discography. This is an EXCEEDINGLY RARE publication, and almost never offered for sale!